The majority of plagues to our health take place over a period of years and only inspire us to change when our lives are affected by a diagnosis. Unfortunately, there isn’t a single cause for any problem, making it increasingly difficult to find a ‘magic pill.’ Instead, the many etiologies that cause disease need to be addressed, from diet and lifestyle, and then adding in supplements and potentially medications to heal. Supplemental solutions such as anti snoring devices can improve snoring, but determining the root cause of snoring and insomnia is also critical. Sleep is incredibly important to our well-being and health. Sleep allows hormones (e.g. thyroid, testosterone, estrogen, growth hormone) to restore and rejuvenate, reduces cortisol (stress hormone that very much contributes to weight gain), reduces sugar/carbohydrate cravings, improves mood, reduces risk of cardiovascular disease, helps you live longer, and improves our ability to grow muscle by burning more calories at rest. Most of our melatonin, our sleep hormone, is made between 11pm-3am, and it’s also our body’s most potent endogenous antioxidant (helps get rid of inflammation, free radicals, and harmful chemicals in our body), so going to sleep at 10/10:30 pm (before our second wind- usually around 11 pm) allows for optimal production, as cortisol also decreases (inverse to melatonin). Cortisol begins to rise (melatonin falls) around 6-8am to wake us up in the morning and get us out of bed. Disrupted sleep and going to bed too late on a regular basis, or even a few days a week, can mess with this curve and leave cortisol high, in which case coffee, Redbull, and a few more cookies are needed for a jolt of energy. Melatonin is made in the pineal gland in the brain, and is signaled to release towards the end of the day and when it gets dark. Most Melatonin is made in our gut (all the more reason for a healthful diet). Optimal sleep is 7-9 hours per night, with the first four being the most important, as we go through a few different sleep stages. We’re fairly conscious during Stage 1, while Stage 2 is a little deeper and less likely to be woken up. Stage 3 and 4 are much deeper, where if woken you feel pretty groggy, as here hormones are made, and tissue growth and regeneration takes place. REM is our last stage, occurring about 90 minutes in, and involves processes that support our energy throughout the day. Unfortunately, many medications and sleep aids disrupt, or don’t allow, these later stages. Poor quality sleep contributes to weight gain as it allows for chronically elevated and disrupted levels of cortisol (causing weight gain in/around the abdomen). Also, cortisol also increases ghrelin, a hormone that tells us we need energy immediately (enter carbohydrate/sugar cravings), and decreases leptin, a hormone that tells us we’re satiated. Irregular sleep (sometimes caused by snoring) can also signal that we are in danger (think of how sleep deprivation is a form of torture), so metabolism slows for the body to hang on to its resources of additional fuel to stay awake (those excess calories we stored in our fat cells). 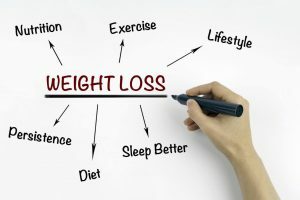 Furthermore, weight/weight gain is a type of inflammation/stress on the body, which also releases cortisol, messes with melatonin production, increases blood sugar and hunger hormones, all of which can affect sleep quality. Fortunately, there are many strategies to address the vicious cycle of how sleep and weight feed into each other. Literally. First, our body likes rhythm- think of how our hormones and other metabolites are made throughout a 24-hour schedule- we mess with the schedule, we mess with our health. Head to bed at the same time most nights of the week, especially around 10/10:30 pm for 7-9 hours of sleep. Aim for 15-minute increments backward if you’re starting from after midnight, as it can be a drastic change/shock. Next, fill your half your plate with dark leafy greens and cruciferous vegetables (e.g., spinach, kale, broccoli, chard, cauliflower, brussel sprouts, collards), as these foods are incredibly rich in vitamins and minerals needed to synthesize important hormones, work to detox/lower inflammation, and balance food cravings. Add in some avocado, coconut oil, and olive oil to help absorb fat-soluble vitamins like A, D, E, and K.
Last, get your vitamin D levels optimized around 50 ng/mL, as it’s an important nutrient to overall health. While these are great foundations to have in place and will help benefit many other issues, consider speaking with a knowledgeable professional who can also work to get to the cause of disease and understand any herb/drug/nutrient interactions.